It should be noted, however, that Baley Thompson, Tranmere’s big centre forward, had the ability to use his chest to pass the ball. Of the 3 balls driven to his chest he was able to rebound the ball to team mates and begin, potential, counter attacks. As a player at the very front of the team, Thompson was a good outlet pass for backs under heavy pressure. Centre forwards can help the back line enormously and relieve pressure by receiving balls to the chest and chesting the ball to team mates and, possibly, begin a counter attack. Thompson’s ability to chest pass the ball was linked into his ability to shield the ball….as featured below. 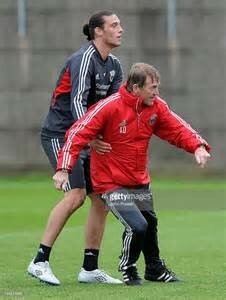 The skill of backing into a player, especially by center forwards, is illustrated with this picture of Kenny Dalglish, the great Liverpool player and manager, teaching the skill to, former Liverpool player Andy Carroll. The ability of players to use their body to win 1 on 1 duels is an essential skill for our players.. 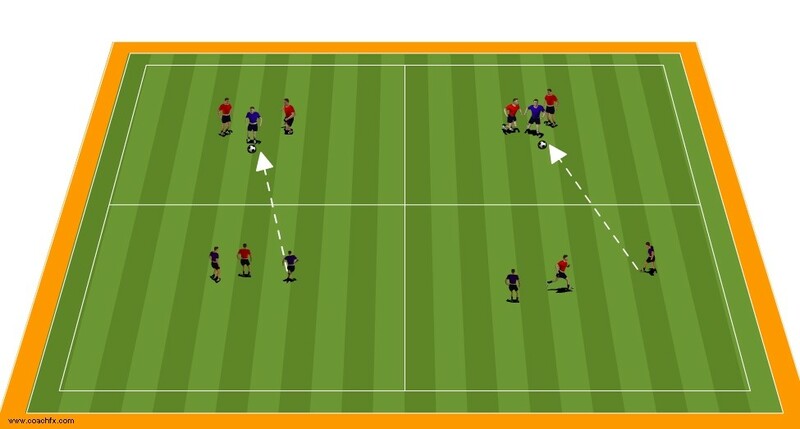 In the featured exercise below, the players stand shoulder to shoulder with the ball between them and when the coach blows the whistle the players fight for possession of the ball and must hold the ball for 10 seconds to get a point. The player whose first step is “Across” the opponent will win the ball! Two red defenders versus one blue attacker on one side of a restraining line – two blue defenders versus one red attacker on the other side. No - one can cross the restraining line. One of the blue defenders plays the ball across the restraining line to the outnumbered team mate on the other side. The defenders MUST allow the attacker to receive and control the ball before trying to dispossess. Play for 2/3 minutes and see how long the attackers can keep the ball. 4v2 on each half of the restraining line. The four attackers must try and keep the ball from the two except that they MUST take 4 touches before playing the ball to a team mate. The time lag will force them to shield the ball otherwise the defenders shall be able to tackle them. When the 2 defenders win ball they pass to team mates on the other side of the restraining line and the exercise is repeated. Play for 5-10 minutes. Blackburn tried this several times, normally on the wide areas of the “Parked bus” and it allowed their flank players several opportunities to get around the defending block on the end of a through pass. Originating from just outside the penalty box the passing player, “stubbed” the pass, putting backspin on the ball, so it quickly checked up and the goalkeeper had no chance of getting to it. 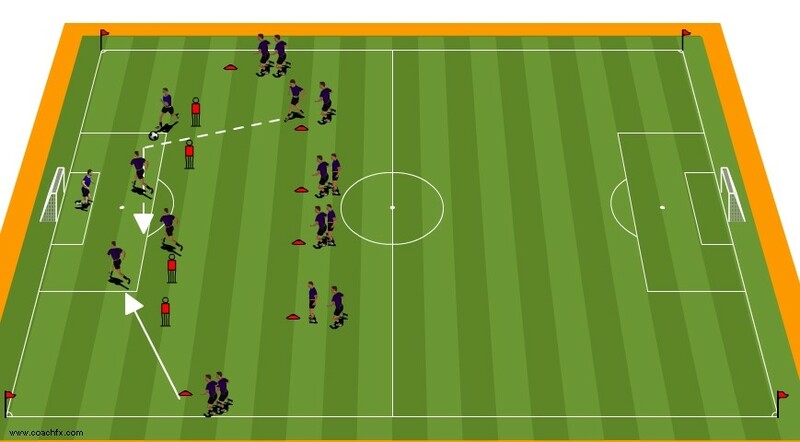 The exercise shown above is a rotational exercise to help players to master this simple, yet, effective, technique.